My prayer is that Seven Levers, and the resources on this website, serves as a catalyst for change in the church. God has given us a task of unbelievable scope and overwhelming proportion, larger than any of us and bigger that all of us. We are blessed with immeasurable resources and we’ve been assigned a mission field that begins in the neighborhoods that surround our churches and that extends to the end of the earth. 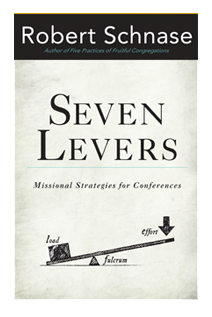 May Seven Levers help us fulfill the mission of Christ in ever more faithful and fruitful ways. Levers help us get things done. The advantage of using a lever is that we can move things that otherwise we could never budge, and heavy loads can be lifted with limited strength. Levers make impossible tasks doable. In physics, a lever amplifies an input force to provide a greater output force. The English word lever derives from the French levant, which means to raise. Levers help us lift things that would ordinarily be too heavy to lift, defying the downward forces of gravity with less effort than would otherwise be necessary. Fifty pounds of effort can lift one hundred pounds of weight with a properly working lever. Organizationally, levers are critical operational focal points for change that allow leaders to derive disproportionate results relative to the amount of work and resources invested. They are fundamental strategies that use our finite resources to greatest effect, making progress against the otherwise unmovable forces of intransigence and decline. Levers multiply results. Each lever leads to multiple system-wide consequences. Levers are not necessarily the easiest places to effect change, but successful work in these areas fosters sustainable long-term benefits. These seven rise to the top because of the extraordinary consensus of research and experience that has developed on the importance of these strategies.